.Star Bright Therapy and Obedience Dogs is an organization which evaluates, tests, trains, qualifies and supports therapy dogs for the purpose of giving loving and empathic support in nursing homes, hospitals, psychiatric wards and other facilities. 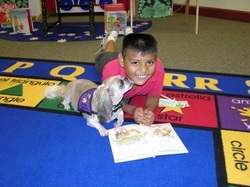 The mission of Star Bright Therapy and Obedience Dogs is to enhance quality of life through the human–animal bond. Therapy dogs are not service dogs or assistant dogs. Service dogs are covered under the Americans with Disabilities Act because someone needs that animal to perform some type of function that is vital to that persons needs. Therapy dogs, on the other hand, perform their tasks by invitation. Many people do not understand the distinction between these two areas. If you would like to be part of a thriving group and give back to our community, please contact us for further information.